This post brought to you by Glad & M&M’S®. 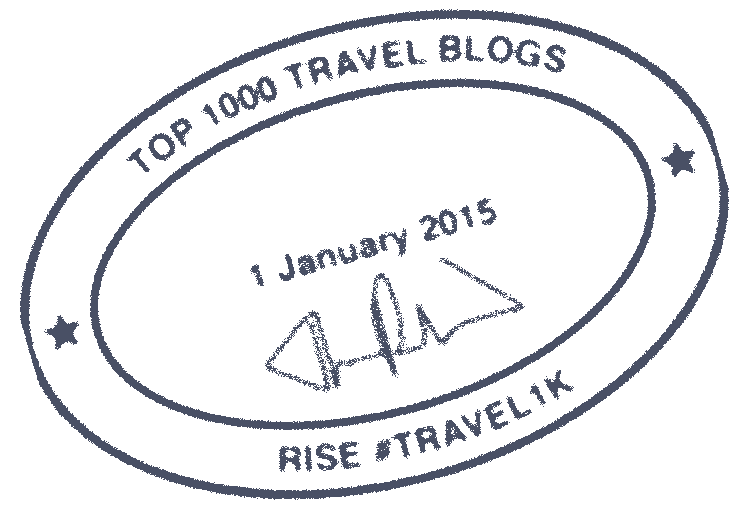 The content and opinions expressed below are that of Surf and Sunshine. My grandmother taught me how to cook and bake from an early age. Last week as we stood around her kitchen island watching my daughter and niece bake sugar cookies I realized she was actually raising her third generation of cooks. I still recall happy memories of spending weekends with grandma baking goodies around the holidays. It makes me smile that my daughter will have those same memories of her. 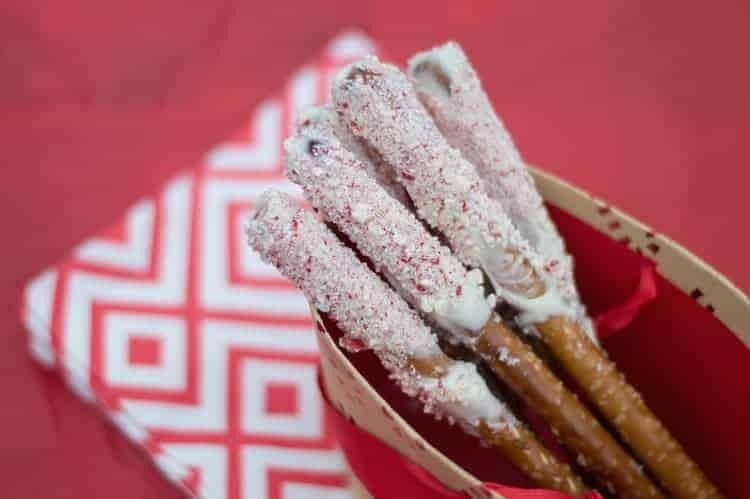 One of her easiest (and kid friendly) holiday recipes were delicious chocolate covered pretzels. She rolls in them in all manner of goodies from caramel to coconut. This year I tried my own hand at making the easy treats with a fun new twist, I rolled them in crushed M&M’S® White Chocolate Peppermint. I love the combination of minty, sweet and salty all at once. Melt chocolate according to package directions, I prefer the microwave method. 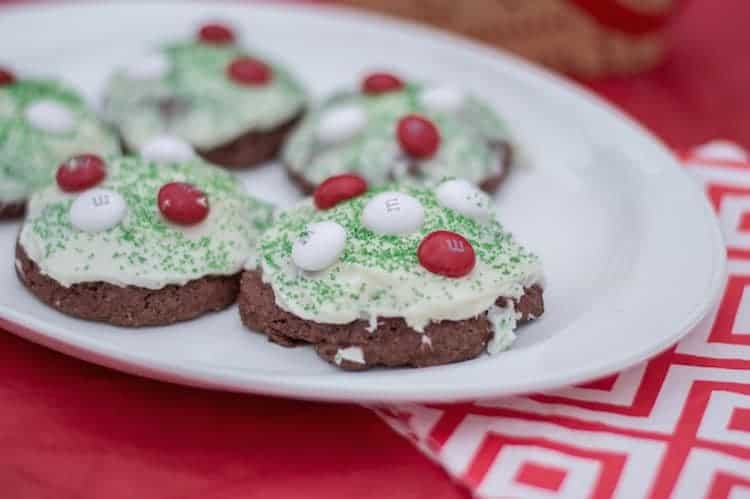 While the chocolate is melting, crush the White Chocolate Peppermint M&M’s with a rolling pin or cooking mallet. Allow the chocolate to dry and then place in a storage container. This second recipe, I can’t take any credit for. I found it on the back of my GLAD Holiday Storage container and it’s delicious! In a medium bowl, mix cake mix, eggs and oil. For each cookie, roll 1/2 tablespoon of dough into a ball and place onto a cookie sheet (no need to grease). Cool on baking sheet 1-2 minutes. Store in GLAD containers and share with friends! Because we always make far more than we could ever possibly eat, we love to package up our goodies and gift them to friends and family. In years past we have always used the plastic goodies bags you can find this time of year but they weren’t particularly protective of our more delicate baked goods. 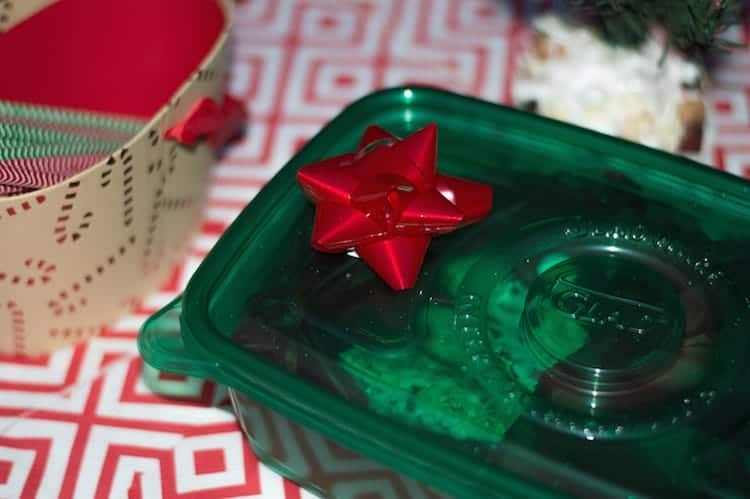 This year, I purchased GLAD Holiday Edition storage containers. 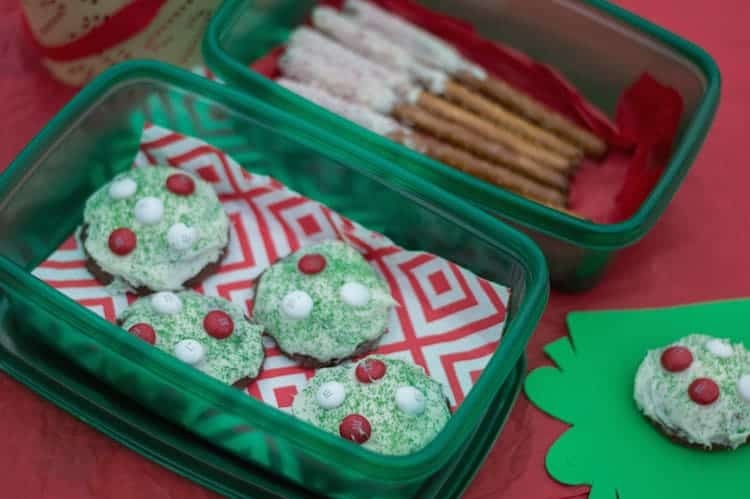 Not only are they adorably festive with gingerbread prints or holiday green, they also come in a variety of sizes to cover all of our baking projects. I put a layer of tissue paper beneath our pretzels and stuck a bow on top for an adorable finish. You can purchase M&Ms White Chocolate Peppermint Candies and GLAD Holiday Edition containers available at Target. It’s Time For Our Annual Family Ugly Christmas Sweater Photos + #Giveaway! Those look heavenly! WHite chocolate and peppermint is my favorite flavor combo! If it has peppermint and it is a cookie or sweet, sign me up. These look so yummy and I like that they are easy to create.